School house designs supplied by the OPW toward the end of the 19th century vary in form but maintain the same basic features; an entrance porch, a cloakroom, the classroom, tall sash windows, an open fireplace and high ceilings, wainscoting on the lower parts of the internal walls, a raised wooden floor, ventilation features etc. The architectural drawings were supplied and distributed by the OPW to locations around the country, and for this reason you can often find identical school buildings at opposite ends of the country. There were a variety of designs available through the decades, and it is often possible to date the construction of a school house to within a few years based on the form of the building. Many of the school houses that were built ‘to-plan’ were extended and modified and many remain in use today. Often a modern school building will have an original 19th-century construction at its core. It is interesting that the many of the principle features of the early schools have been retained such as high ceilings and windows. These features reflect the ecclesiastical and monastic origins of school house design that persist to this very day. They also reflect the continuing control that Churches had on the school system. What makes a building important? Contemporary 19thand early 20th-century sources in Britain and the US (Bernard 1848; Patterson 1875; Shawkey 1910) provide, first-hand insights into the ideological and societal backgrounds behind school architecture of the period. In Britain Weiner (1994) dedicates significant wordcount to architecture and social reform in late-Victorian London from the perspective of school design, however it is part of an over-arching examination of the subject as a whole. Similarly, Avery (2003) presents a comprehensive overview of Victorian and Edwardian architecture in Britain which includes dedicated passages relating to school houses designed and constructed during this period. Both publications treat the physical and architectural environments in their historical contexts, offering a late-20th century perspective on the impact of Victorian and Edwardian reform on architecture. However, neither publication is concerned with the modern-day significance of these buildings to the modern-day populations which engages with them on a daily basis. To be fair to both publications, such a consideration is well beyond their assigned academic remit. Henry Glassie is a professor of folklore at Indiana University in the United States. He has published extensively on the topic of material culture, and in the 2000 he published a book that was simply titled Vernacular Architecture. Glassie’s publication drew on his three decades of observations of vernacular architecture from around the world, and showed that common buildings, and the meanings and associations attached to them, contributed to a more democratic telling of history. Glassie viewed buildings like poems and rituals, in that they realise culture and reflect in a material way, the thoughts, beliefs and experiences of the people that design, build and use them. Of course, this is true about all architecture, not just the vernacular traditions. But what do we mean when we talk about vernacular architecture, and are school houses vernacular structures, or imposing institutional buildings? Vernacular architecture exists everywhere there are human populations around the world. It can’t be defined as a particular architectural style that you might recognise like Baroque or Neo-Classical, but rather a building paradigm where the arrangement of the structure is the simplest form of addressing human needs. It is a pure reaction to an individual person’s or society’s building needs, and has allowed everyday people, even before the architect, to construct shelter according to their circumstance. Some are the exotic products of indigenous people in places unknown to us. But others are familiar, maybe too familiar, and so are overlooked and unappreciated. This is the case with many of the school houses featured here. The autumnal evening sun hangs low in the sky, and the few clouds that have lingered as twilight beckons are tainted red and orange around their fringes by the setting sun. From the forested hills of the Slieve Aughty Mountains in south Co. Galway, I can see across into Co. Clare, with the stoney plateau of the Burren silhouetted blue by the bright, dropping sunlight. I’ve spent the day touring around South Galway indulging in a recent pastime of mine; looking for what I consider to be a derelict beauty. 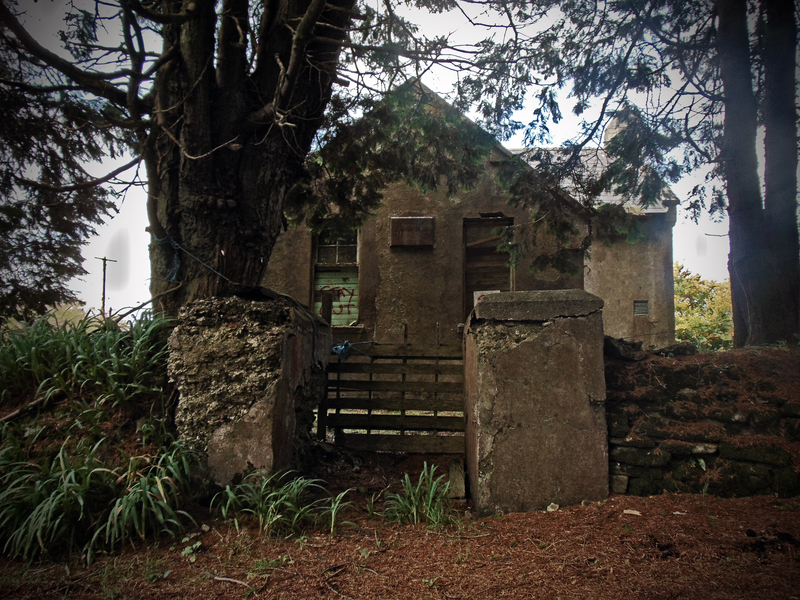 Beside where I’m standing on the low hillside, and hidden in the dense forestry plantation of the Slieve Aughtys, is the now-disused, one-roomed Reyrawer National School; dilapidated and empty, haunting and isolated. I’m here to photograph the school, and to get a sense of the local environment, both in its present state and in the past. The landscape around here has changed significantly over the past 50 years. The now forested hill-sides are dotted with the ruins of former farmsteads. The former pasture and rough grazing lands have been sown with coniferous plantations, and the ubiquitous and imposing wind-turbines highlight the movement away from agrarian living in this area, as an alternative and profitable use is sought for this now people-less landscape. In the Aughtys, the result is an empty space, a desolate place where few people live. 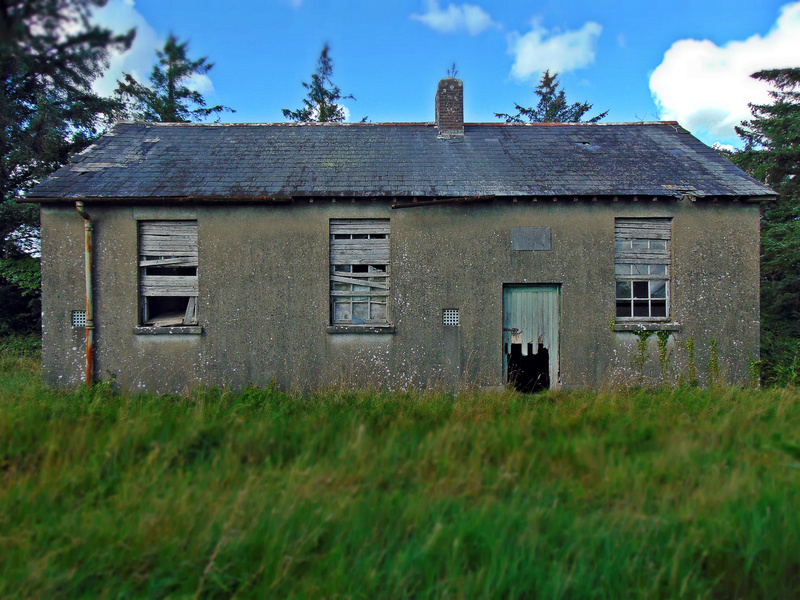 An unintended but welcome consequence of this depopulation is the creation of a welcome retreat from the ribbon development popular across much of the Irish landscape – though the man-made forests bear a hunting watermark of former settlement, with field boundaries, bóithríns, houses, farms, and infrastructure such as disused schools, hidden throughout the forests. When Reyrawer National School was in use, this was a lived-in landscape which supported a scattered, largely agrarian population. With the movement away from this lifestyle, the landscape was emptied and the school was no longer needed. The plaque on the eastern gable of the building dates the construction of the school to 1891. It closed in the late 1950s. On 12 September 1893 the Great Southern and Western Railway opened a branch line off the existing Tralee–Mallow line, connecting the village of Farranfore with Valentia Harbour on the southern shore of Dingle Bay. At that time it was the most westerly railway line in Europe and passed through some of Ireland’s most spectacular scenery as it climbed through Kerry’s mountainous countryside. It served as the main transport system for the Iveragh Peninsula for 75 years, with the last train departing Killorglin on 30 January 1960. So, for 67-odd years, a steam-powered locomotive chugged daily along the Farranfore–Valentia Harbour line, passing just north of the glacial lake Lough Carragh, and stopping at Glenbeigh Station. This station was at the foot of Seefin Mountain, and the surrounding landscape at the turn of the twentieth century was beautiful, wild and remote. There were few distractions intruding from the outside world, and the coming and going of the steam train punctuated the day. In the surrounding hills and mountains, schools did not have clocks, and the whistle of train in the quiet landscape as it passed over Curraheen level crossing at 10.15 a.m. let the local schoolchildren know that it was am sos (‘break time’). The village of Roundwood in Co. Wicklow claim that at 238 m OD, their’s is the highest village in Ireland. However in recent years, the village of Meelin in Co. Cork has erected a braggadocious signpost at the edge of their humble home stating ‘Welcome to Meelin – Ireland’s Highest Village’. The brazen folk of this tiny north-Cork hamlet claim that their little settlement, located just south of the Mullaghareirk Mountains, is 15 m higher than their Wicklow rivals. If you investigate the issue online, you might find various reasons why one village believes the other’s claim to the title of the most elevated settlement is illegitimate. In all honesty, the argument could probably be settled in minutes by pulling out an Ordnance Survey Map… but what’s the fun in that? 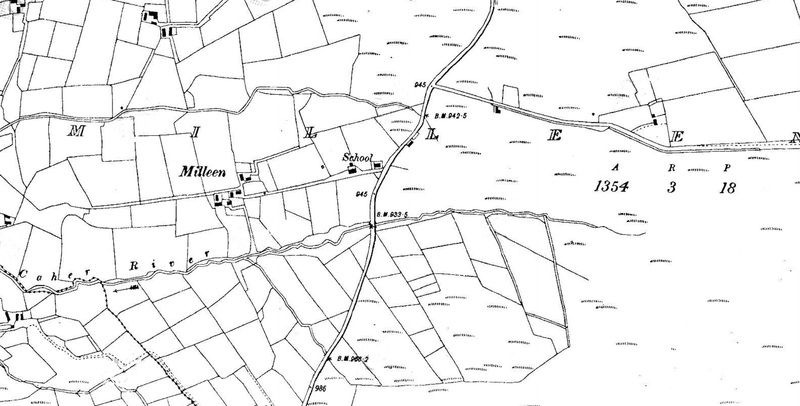 The plucky village of Meelin is located in northwest Cork. It is one of a handful of small villages located north of Newmarket near the Cork-Kerry-Limerick border. It is unlikely that your travels would ever take you through this area; much of the land close to the village is planted with coniferous trees, mainly of lodgepole pine and Sitka spruce. The area is sparsely populated though the woodlands are filled with ruined cottages and farmsteads which remind you that there was a time when the lands here were farmed rather than planted with commercial forests. 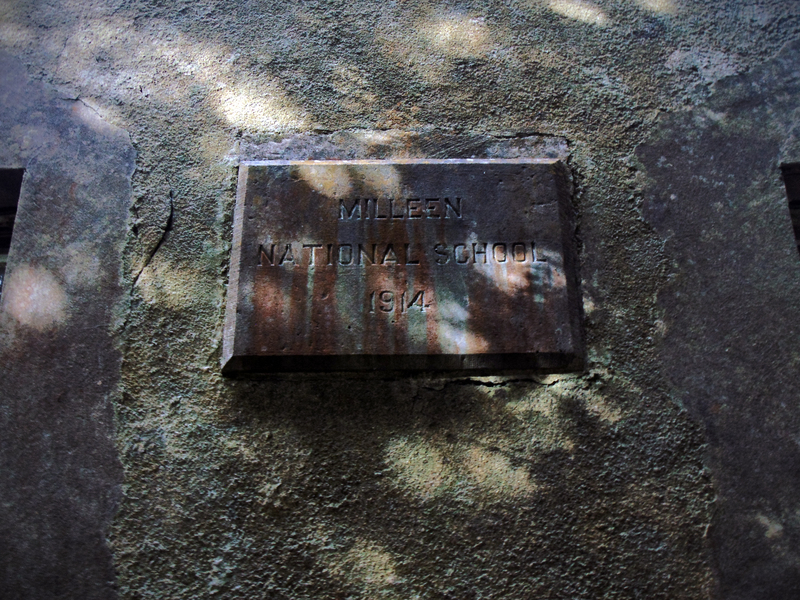 It is here amongst the plantations just north of the village of Rockchapel that you will find the now disused Old Milleen National School in the townland of Milleenduff. The building is hidden from view by mature evergreens, with the Caher River flowing just to the south. On a bright day, sunlight flashes through moving branches of the surrounding woodlands onto the south-facing gabled entrance with it’s centrally placed name and date plaque. The planted woodlands have largely consumed the surrounding vernacular farming landscape that existed to the east here when the school was in use. The rural landscape is not static, and has changed quite a bit over the recent decades. Although the hills, mountains, rivers and lakes don’t move much, the way that people interact with the landscape, and the character of the environment is dynamic and fluid. Rural towns and villages that were once important market places and a hub of rural activity, fade into a mere collective nostalgia for times gone by, as young people gravitate to cities and the landscape empties. I’m from County Galway and anytime I would have travelled to Dublin in the past, it was a straight burn along the N6 through Ballinasloe, Athlone, and on to the myriad of bottlenecks as you approached the capital. In more recent years the M6 means that I rarely see any of these towns anymore. Before motorised transport and the railway, distance was largely the determining factor when choosing a route from west to east. Travelling from Galway to Dublin by carriage or on foot, it was likely that you would take a route through Loughrea, Killmor and Eyrecourt, crossing the River Shannon at Bangher in Co. Offaly; all the while passing near or along a much more ancient route, An Slighe Mhór. But this is not the case today when the motorway saves you from having to negotiate town and village streets as you travel. 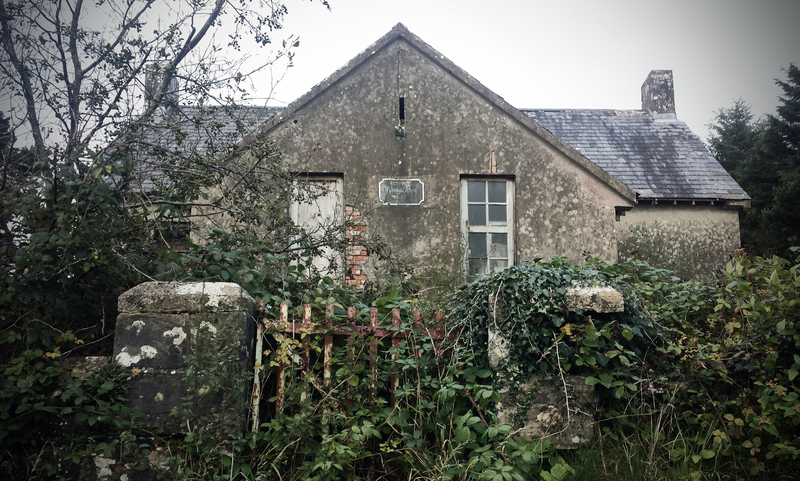 The reason I mention it is to explain why, that in the three or so years that I’ve been photographing these old school houses, I had not passed by Coolagh in the parish of Abbeygormacan near Killoran (along the former road to Dublin) , and noticed the old school house there. The building is located on the northern side of the N65 about 3 km beyond Gurtymadden Cross when travelling east. It’s late evening near Westport in Co. Mayo after an unusually dark day in late July. The sky has been overcast all afternoon and the air is damp but warm. When I think about Irish summers in the west of Ireland this is undoubtedly the weather I think of; June can (sometimes) bring long hot days but once the Atlantic Ocean has warmed up then the air becomes heavy with moisture. June had been exceptionally warm and dry this year, but now the grassy drumlins around this part of Mayo are fresh after a recent rain shower. I’ve taken a spin out from Westport toward Castlebar. About halfway along this route there’s a boggy rural spot hidden amongst the drumlins called Islandeady. A friend of a friend had let me know that there’s and old school house located out here and so with an hour or two to spare before sunset I went out to take a quick look. The parish of Islandeady still contains four (small) working national schools; Cloggernagh, Cornanool, Cougala and Leitir. But the school house at Leitir replaced an earlier school building that still stands, and it is this structure that I’m interested in. Today it’s modern successor has just 6 girls and 4 boys on the coming years enrollment, and I wonder if it’s likely to stay open for much longer. Getting to the Inishkea Islands off the west coast of County Mayo can be difficult. There is no ferry service or regular connection between the mainland and the two offshore islands. Located out beyond Blacksod Bay, apart from flocks of free-roaming sheep and a thriving seal colony, the islands have been uninhabited since 1934. The Inishkea Islands have lain almost untouched since the last permanent residents left. Visitors are infrequent by all accounts, though a man has reportedly been living on the north island for two years without contact, electricity or even a boat. The wilds of County Mayo are spectacular. Along the rugged west coast the skyline is marked by the Partry and Nephin Beag ranges. On Achill Island, the northern slopes of Croaghaun mountain plummet from 600 m OD to the sea below, while on it’s southern side it shelters one of the most beautiful beaches in Ireland, Keem. To the southeast of here is Clew Bay with its plethora of low drumlin islands, while inland the landscape is dotted with rivers, lakes, bogland and the occasional turlough. Lough Mask is located to the south of Co. Mayo. Along the lakes western shore is the village of Tuar Mhic Éadaigh, and if you ever get the chance, I would recommend the trip from here to Westport across the hilly and barren emptiness of Aughagower. The landscape comprises blanket peat that is unproductive, there are few homes though there are the crumbling ruins of many vernacular houses long deserted. Wild and ragged mountain sheep roam the narrow roads. It is just south of this area that you’ll find the little hamlet of Finny. On high land, it affords spectacular views of a narrow part of Lough Mask. Almost directly across from Dead Island on the lake, and along the R300 road, is Old Finny National School. The building is disused now, and being so off the beaten track, it probably has very few inquisitive visitors.